Banana Pudding is a thoroughly classic Southern dessert. It comes in many forms, but almost all involve vanilla pudding with slices of bananas and a layering of vanilla wafers. This combination, quite frankly, reminds me of going to Morrison’s Cafeteria with my grandmother in Clearwater, Fl. Although I have fond memories of those outings, the food was neither good, nor memorable. It seems to me that banana pudding should be made with bananas, not just as an accessory. This may be a conclusion based on the fact that I only had two overly ripe bananas in my fruit basket when this recipe came to me. I pureed them and added them to the vanilla pudding as I whisked it. The result is a rich flavor, which beats the pants off of the unnatural “banana extract” or liqueurs many recipes call for and it has a silky smooth texture. I thought it should be topped with something warm, caramel-y and have just a slight bite of Bourbon. 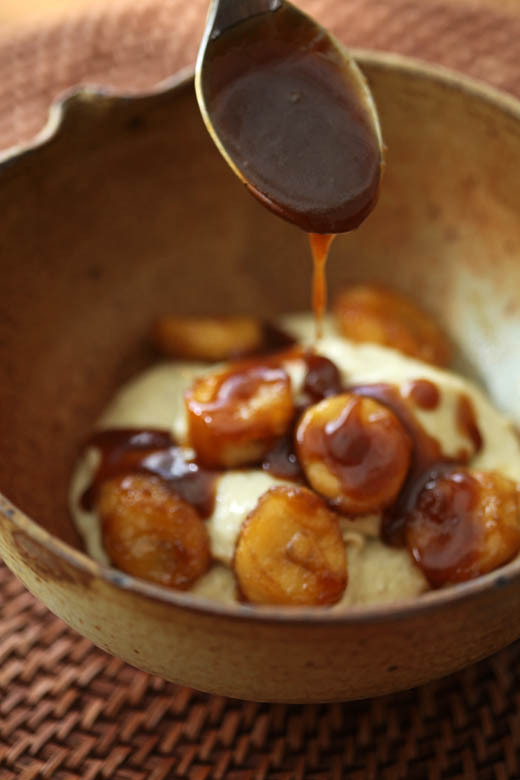 Banana Foster on top of the pudding, an ode to Mardi Gras! For those who just can’t fathom banana pudding without vanilla wafers, by all means you should crush some up and sprinkle them over the top. I’d like to thank YOU and Babble.com for voting Zoë Bakes on to the list of Top 100 Mom Food Blogs 2011! It is a crazy honor to be listed with such talented women. 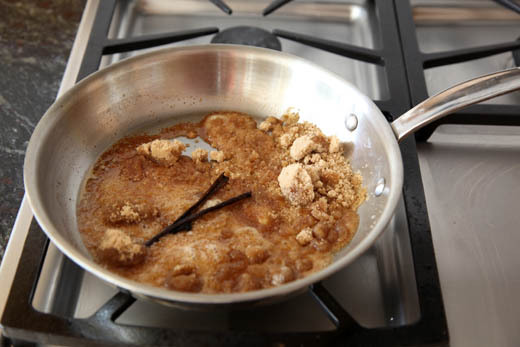 Heat the half and half, 1/4 cup of the sugar and vanilla bean in a non-reactive pan over medium low heat, unitl just simmering. 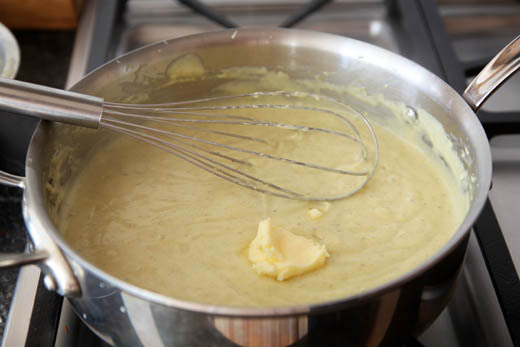 Whisk together the egg yolks, remaining sugar, cornstarch and banana puree. 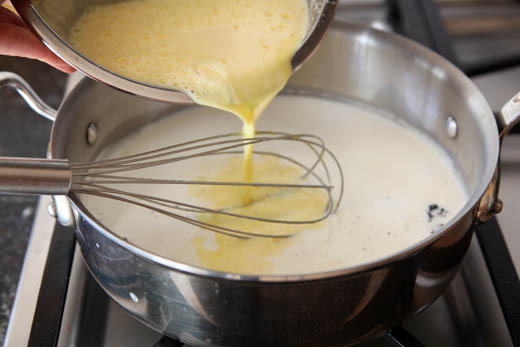 Once the milk simmers, add a small amount of the hot milk into the egg yolk mixture to warm the yolks. 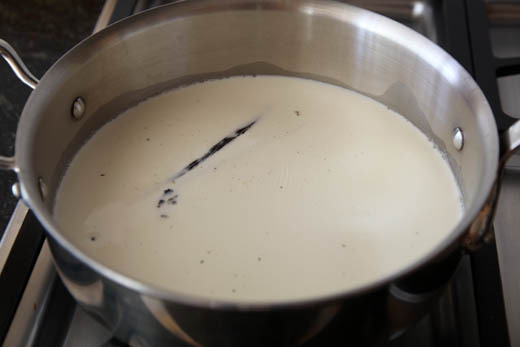 Return the yolk/banana mixture to the pan of milk and bring the mixture to a boil. 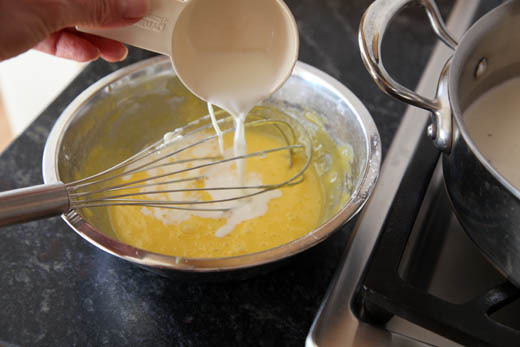 Whisk continuously for 3 minutes. This is very important or it will feel grainy. 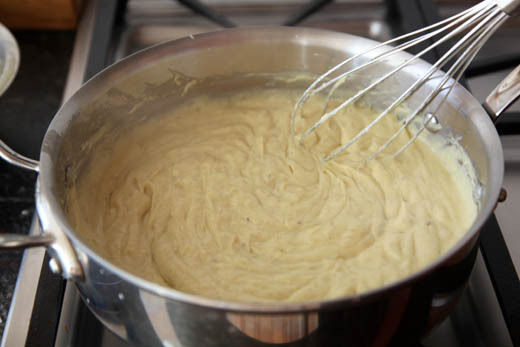 The pudding may get thick before the 3 minutes are up, but keep whisking. 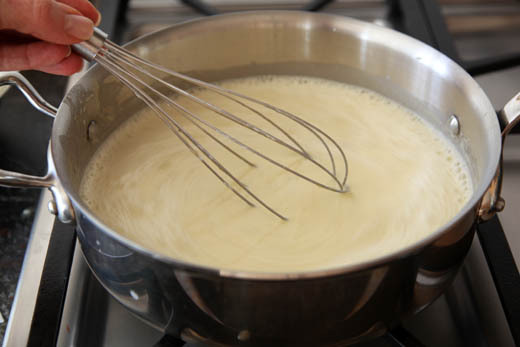 Once the pudding has been boiling for 3 minutes, whisk in the butter. 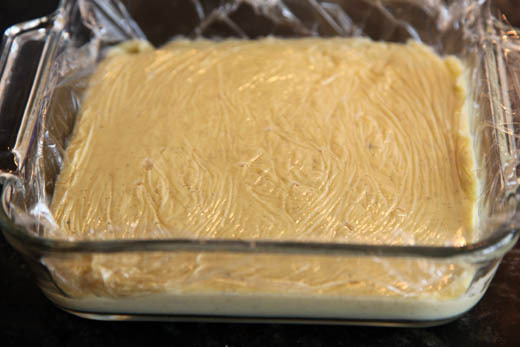 Pour into a non-reactive shallow dish and cover with plastic wrap directly onto the surface of the pudding. heat over medium until the mixture melts and is just beginning to smoke. 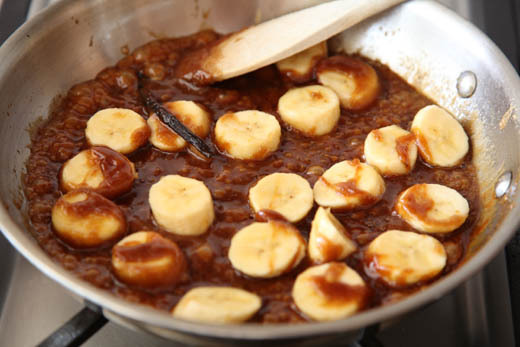 Slice the bananas into 1/4 inch thick coins and add to the caramel. 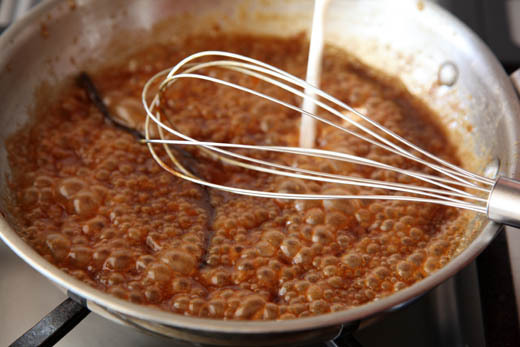 Gently toss them in the caramel. 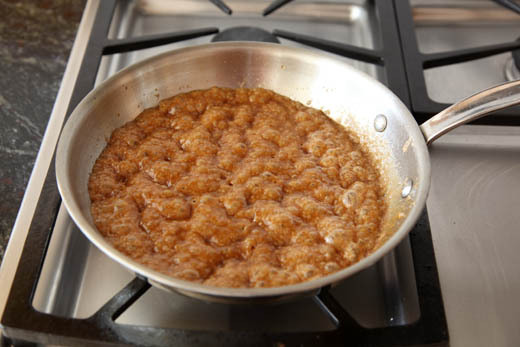 Once they have softened slightly and have taken on some of the caramel color, remove the bananas with a fork and set them aside. 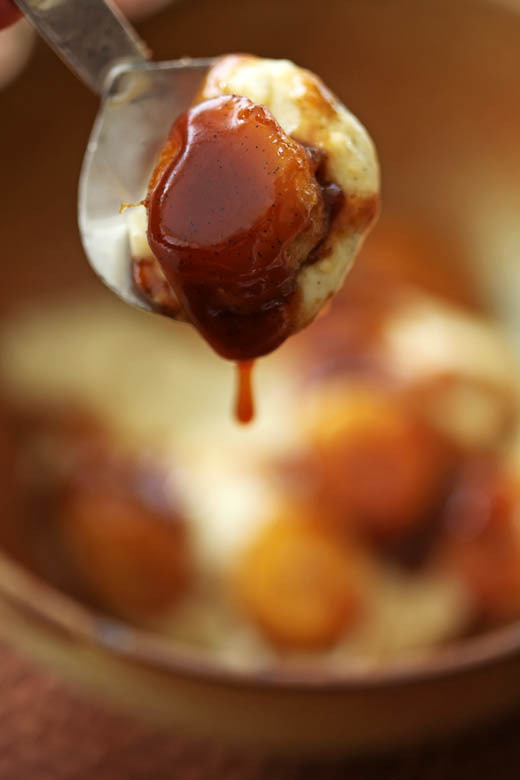 Spoon the bananas and caramel over the pudding and serve with a dollop of lightly sweetened whipping cream and vanilla wafers. Oh. my. god. 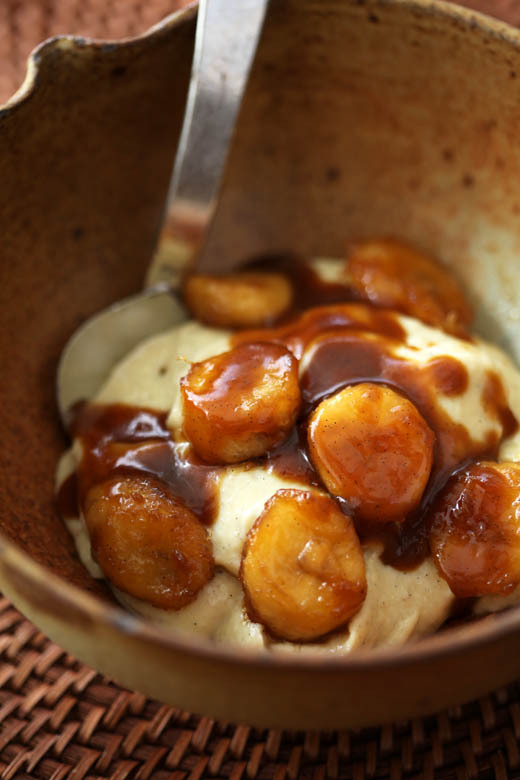 There’s nothing better to me than bananas in dessert form. This is like banana overload with bourbon. Must. Make. Well of course I came running. Duh! I had no idea banana pudding was a southern classic. It always makes me think of that dessert with Nabisco wafer cookies which isn’t really banana pudding. Loving this recipe. LOVING. 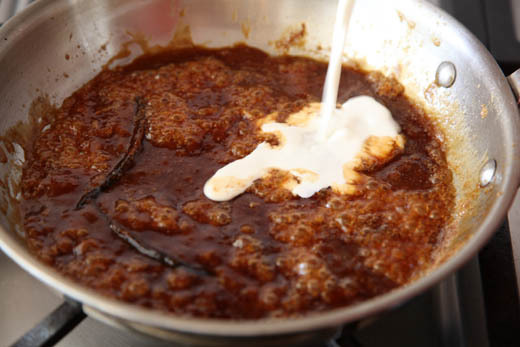 Ohhh You are making me crave the caramelized bananas of my childhood in Kerala. 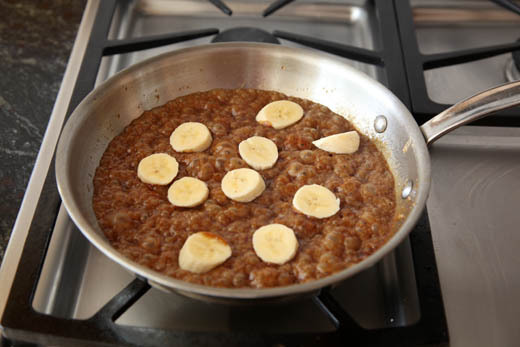 Maybe because we have a plentiful supply of bananas there we fry them, roast them in their skins until charred – so yummy!, caramelize them, stew them! And don’t even get me started on the savoury dishes- even the stem and flower are cooked! And the large leaf used to serve everything on! Its nice to see how other cultures use bananas! That pudding looks very interesting too! You fry them in the skins? Amazing, I have never heard of doing this! This looks amazing. 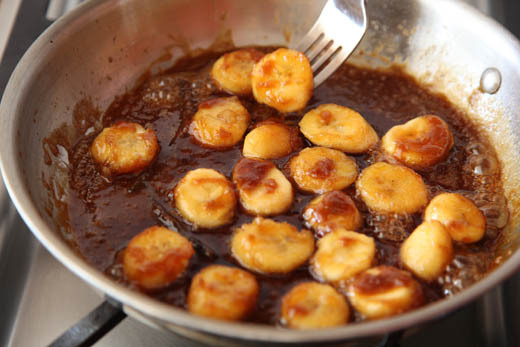 I love bananas in caramel. I also adore vanilla custard. I think I must try this. I don’t have bourbon but I am sure I’ll find something in the cupboard to take its place 😉 I take it your half and half is low fat milk? OMG is there any left? of course, it’s one of my favorites, especially in the winter. Sounds yummy. I can’t wait to try this. Oh my! This is something I’ve never had before but it looks terrific! As someone who ate a lot of not-so-wonderful-in-retrospect banana puddings growing up, this looks extremely tasty! This looks delicious, and I can’t wait to make it! Congrats on your Top Mom Food Blog award! Just back from NOLA a couple weeks ago. On a whim, and after a second bot of vino, a friend ordered Bananas Foster@the Palace Cafe. Once the flames died down, surprisingly tasty. Your take on this southern classic takes me back. Oh, and I’m fine doing this one w/o the soggy vanilla wafers . . .
Will have to try this. It looks awesome! I made this earlier today and it was FANTASTIC!!! It wasn’t a pretty yellow color like I thought it would be but OMG Zoe it tastes great!!! Question: How do you do this if you need to make it a day/ morning ahead? I know the bananas foster part needs to be done before eating, but can you reheat the pudding or eat it cold with the warm bananas foster?